Shop Millercare’s line of children’s wheelchairs that includes chairs that are easy to manoeuvre, light in design and simple to use. These chairs have the function and capabilities to accommodate growing children. When choosing a children’s model many factors have to be considered, including size, style, and weight. How long your child will occupy the chair, whether or not they require specialist seat cushions, and where the chair will be used, outdoors, indoors or a mixture of both? If you need any further assistance, come and visit us in store where our experts can provide some additional assistance in choosing the right chair for your child. Use our brand locator tool to find the store nearest to you. The designs here reflect the needs of a growing child. Millercare’s objective is to provide your children with chairs that enhance their daily life, depending on their degree of disability. With robust and dynamic designs, Millercare has a selection of children’s wheelchairs that are designed to meet the needs of modern, active and growing youths. The Little Wave wheelchair, with prices from £1445, has the ability to move easily through an environment and the design ensures children can use their strength and leverage to their advantage to move the model around easily. Designed with aluminium the frame is as light as possible, whilst extremely rigid which makes it easier to manoeuvre and ensure your child gets the most out of every push. The CG adjustment is simple and straightforward. The clamp design of this kids wheelchair allows placement of the backrest right where it needs to be because you do not need to worry about interference with hardware in order to achieve the seating position required. A multi-adjustable flip-up footplate allows for an infinite number of positions over time, so it can be repositioned as the rider grows, a strap allows the user to lift up the footplate without bending down too. Thanks to frame Xpanders, the Little Wave allows the chair to grow with the user, so there’s no need to worry that you’ll need a bigger replacement chair in few years, these maintain the structural integrity of the chair far better than bolt-on cross bars too. 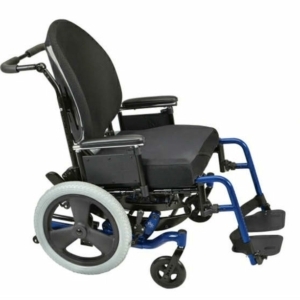 The Focus kids wheelchair, with prices starting from £1750, is an attractive and minimalistic design with a 50-degree tilt using the Science of Complex Rotation. The new 16x2 mag rear wheels and 6 x 2 solid casters make it easier to handle everyday obstacles such as curbs and inclines. With a noticeable improvement in roll ability, the chair floats effortlessly across soft ground while rolling easily indoors. Smart Tilt on the Focus children's wheelchair tells you how much adjustment is needed, also only 2 bolts are required to make the CG adjustment, and it can often be done whilst the user is in the chair too. With the industry's most effective seat height possibilities you'll find it more functional too, and the better wheel access, which featured an inset tilt mechanism, reduces the limitations between seating setups and wheel placement. 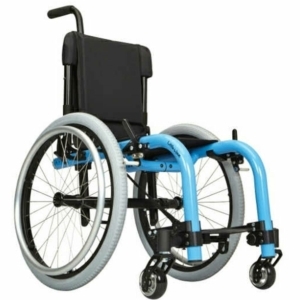 This gives greater access to the wheel and offers better weight distribution between the rear wheels and front casters. Millercare offers children’s wheelchairs that are comfortable, robust and easy to use. Support and comfort are important considerations to factor in, and with these models, you have exactly that.